It was the largest empire of the Classical antiquity period, and one of the largest empires in world history. At its height under Trajan, it covered 6.8 million square kilometers and held sway over some 70 million people, at that time, 21% of the world’s entire population. The longevity and vast extent of the Empire ensured the lasting influence of Latin and Greek language, culture, religion, inventions, architecture, philosophy, law and forms of government on the Empire’s descendants. Throughout the European medieval period, attempts were even made to establish successors to the Roman Empire, including the Crusader state, the Empire of Romania and the Holy Roman Empire. By means of European expansionism through the Spanish, French, Portuguese, Dutch, Italian, German, British, Belgian empires, Roman and Greek culture was spread on a worldwide scale, playing a significant role in the development of the modern world. 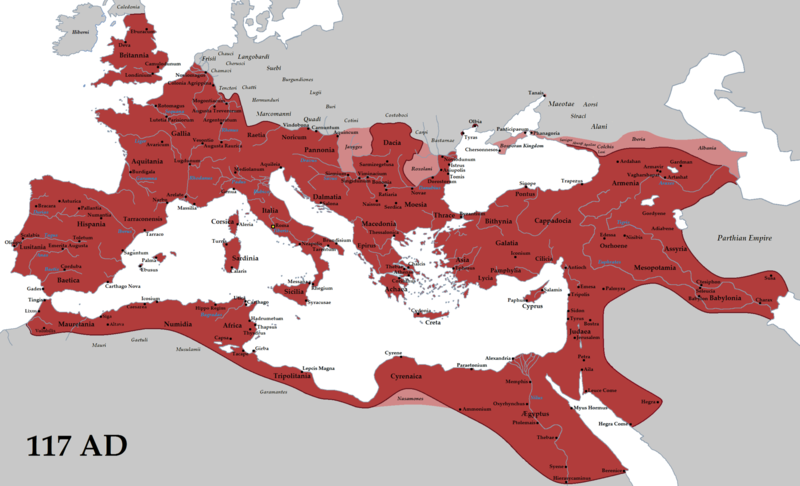 Rome had begun expanding shortly after the founding of the Republic in the 6th century BC, though it didn’t expand outside Italy until the 3rd century BC. In a sense then, it was an “empire” long before it had an Emperor. The Roman Republic was not a nation-state in the modern sense, but a network of towns left to rule themselves (though with varying degrees of independence from the Roman Senate) and provinces administered by military commanders. It was ruled, not by Emperors, but by annually elected magistrates (Roman Consuls above all) in conjunction with the Senate. For various reasons, the 1st century BC was a time of political and military upheaval, which ultimately led to rule by Emperors. The consuls’ military power rested in the Roman legal concept of imperium, which literally means “command” (though typically in a military sense). Occasionally, successful consuls were given the honorary title Imperator (commander), and this is the origin of the word “Emperor” (and “Empire”) since this title (among others) was always bestowed to the early Emperors upon their accession. Rome suffered a long series of internal conflicts, conspiracies and civil wars from the late second century BC onwards, while greatly extending its power beyond Italy. Towards the end of this period, in 44 BC, Julius Caesar was briefly perpetual dictator before being assassinated. The faction of his assassins was driven from Rome and defeated at the Battle of Phillipi in 42 BC by an army led by Mark Antony and Caesar’s adopted son Octavian. Antony and Octavian’s division of the Roman world between themselves did not last and Octavian’s forces defeated those of Antony and Cleopatra at the Battle of Actium in 31 BC. In 27 BC the Senate and People of Rome made Octavian princeps (“first citizen”) with proconsular imperium, thus beginning the Principate (the first epoch of Roman imperial history, usually dated from 27 BC to 284 AD), and gave him the name Augustus (“the venerated”). Though the old constitutional machinery remained in place, Augustus came to predominate it. Since his rule ended a century of civil wars, and began an unprecedented period of peace and prosperity, he was so loved that he came to hold the power of a monarch de facto if not de jure. During the years of his rule, a new constitutional order emerged (in part organically and in part by design), so that, upon his death, this new constitutional order operated as before when Tiberius was accepted as the new Emperor. The 200 years that began with Augustus’ rule is traditionally regarded as the Pax Romana (“Roman Peace”). During this period, the cohesion of the Empire was furthered by a degree of social stability and economic prosperity that Rome had never before experienced. Uprisings in the provinces were infrequent, but put down “mercilessly and swiftly” when they occurred. The sixty years of Jewish–Roman wars in the second half of the first century and the first half of the 2nd century were exceptional in their duration and violence. The success of Augustus in establishing principles of dynastic succession was limited by his outliving a number of talented potential heirs: the Julio-Claudian dynasty lasted for four more emperors—Tiberius,Caligula, Claudius, and Nero—before it yielded in 69 AD to the strife-torn Year of Four Emperors, from which Vespasian emerged as victor. Vespasian became the founder of the brief Flavian dynasty, to be followed by the Nerva–Antonine dynasty which produced the “Five Good Emperors”: Nerva, Trajan, Hadrian, Antoninus Pius and the philosophically inclined Marcus Aurelius. In the view of the Greek historian Dio Cassius, a contemporary observer, the accession of the emperor Commodus in 180 AD marked the descent “from a kingdom of gold to one of rust and iron”—a famous comment which has led some historians, notably Edward Gibbon, to take Commodus’ reign as the beginning of the decline of the Roman Empire.